My line of Oregon Greeting Cards/ Note Cards has gradually grown over the last few years. 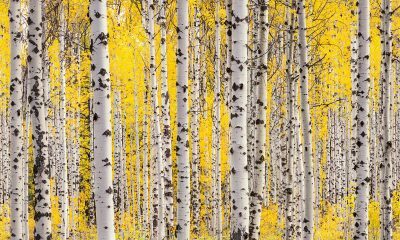 I’m anticipating the arrival of 5 new cards, which I believe will help balance out my Oregon Greeting Cards collection. Broken Top Mountain, located in Oregon’s Three Sisters Wilderness Area is a favorite hiking and climbing destinations for Central Oregonians. Countless miles of alpine hiking lure explorers from all over Oregon. Broken Top receives a heavy winter snow-load, so its summer hiking season is short but beautiful. I captured the image to the left, Broken Top Eruption in the summer of 2017, shortly before a harsh wildfire season, smoked out much of the Three Sisters Wilderness Area. 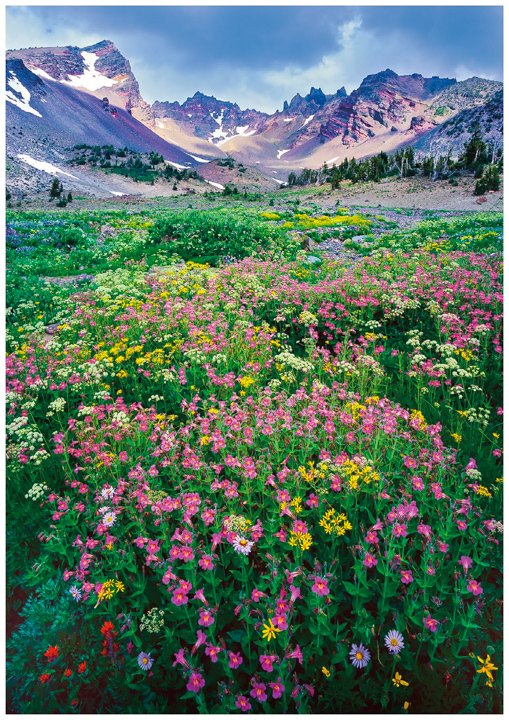 My fine art prints of Broken Top Eruption are gorgeous as are my new greeting cards of the same image. 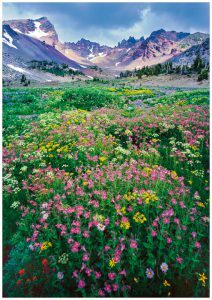 It is a celebration of alpine wildflowers and one of Oregon’s most iconic mountains. This Note cards will be a favorite for hikers and gardeners from across Oregon! This Broken Top Greeting Card will be available on my website in packs of 8 and at a variety of retail locations across Oregon. If you are affiliated with a retail organization and are interested in carrying my expanding line of Oregon Greeting Cards, please contact me directly 541-610-4815 to discuss wholesale pricing. 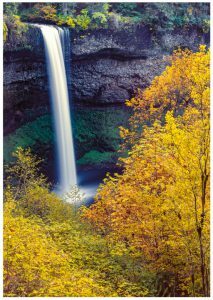 Silver Falls is on of the gems of Oregon’s renowned State Park system. Lush, almost tropical forests, are highlighted by an unprecedented collection of waterfalls. South Falls, pictured in my newest note card, is the most accessible of all the waterfalls at Silver Falls State Park and arguably the most photogenic. I’ve noted increasing demand for my Oregon Note Cards from people in Oregon’s Willamette Valley. This new Silver Falls greeting card is a thank you for all of my supporters in the Willamette Valley. 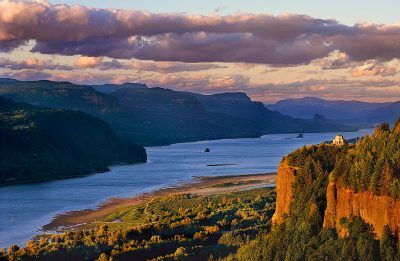 Located near the picturesque town of Silverton, Oregon, Silver Falls and not far from Salem Oregon, it is a favorite amongst visitors to Western Oregon. Tamolitch Pool is located on the McKenzie River west of Oregon Cascade Crest. Tamolitch Pool’s azure waters gleam like a precious sapphire in the sun. The bluest water I’ve ever seen is truly something to behold. 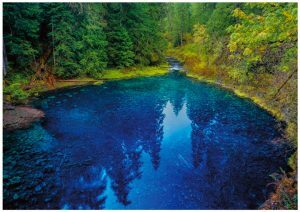 Located along Oregon’s iconic McKenzie River Trail, Tamolitch requires a 2.5 mile hike through old growth forests and lava flows. Tamolitch Pool’s waters are…frigid. 38 degree temperatures , year-round are not for timid swimmers. While Tamolitch Pool, also known as the “Blue Pool” looks shallow, it is nearly 60 feet deep. Widely considered to be One of Oregon’s most scenic waterfalls, Proxy Falls is also located west of Oregon’s Cascade Crest, just inside of the western edge of the Three Sisters Wilderness. The hike into Proxy Falls is a pleasant 1.5 mile stroll through old- growth fir forests, accented by profusion of rhododendron blossoms in spring and the technicolor dream of vine maples in autumn. The magic of Proxy Falls is awoken by getting close to its spray. This requires a short scramble down a muddy slope but it is worth it. Prepare to get wet and embrace the magic of one of the most enchanting waterfalls in the world. Proxy Falls is mesmerizing to experience. It’s braided falls connect and disconnect like a hydrological spider web. 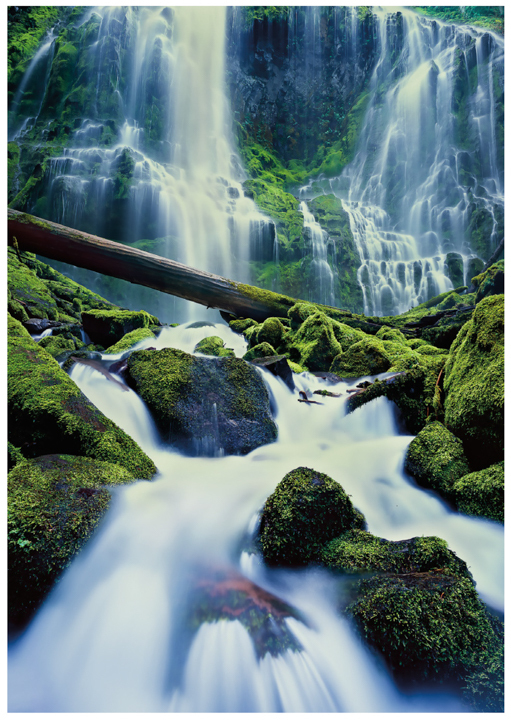 This beautiful waterfall is technically referred to as “Lower Proxy Falls”. Also on the Proxy Falls loop hike is the smaller Upper Proxy Falls which holds its own alluring charms and is a short and very worthy side hike. Proxy falls is less than an hour from Eugene, Oregon where I hope to have my line of greeting cards available for sale in the near future. The beautiful Painted Hills of John Day are a 90 minute drive east of Bend, Oregon. I certain spring seasons, these geologic wonders are swept up in a sea of yellow cleomes and chaenactis flowers. 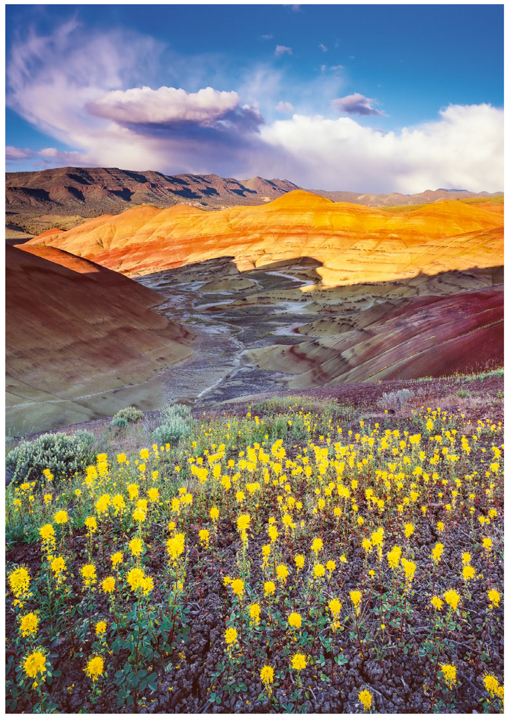 This new greeting card of the famed John Day Painted Hills was captured at the height of an epic wildflower bloom and immediately after an evening thunderstorm. The Painted Hills, located near the city of Mitchell Oregon are a wonderful day trip into arid and striking Eastern Oregon. 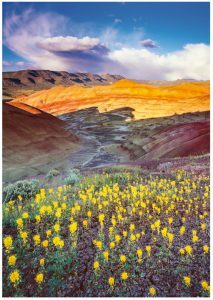 To see the beautiful fine art landscape photograph of this image, please visit, Oregon Painted Hills photos. A beautiful selection! I was crossing my fingers you would include something from The head of the Metolius or the bridge at the hatchery, maybe next time. I definitely plan to order this set, was wondering if you could tell me who published them for you? The Metolius is a stunning place! 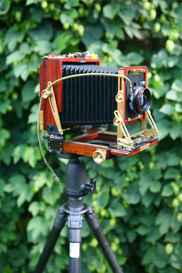 Printing. I have a person who does my graphics layout and text work for my cards. They also arrange for the printing and I honestly don’t know who does it. I know it is on the West Coast somewhere. It also know that is is “Offset Printing” which means they have to arrange plates for the printing and to pencil out I have to print thousands at a time.